“it’s coming home it’s coming home the cup is coming home” the famous song from the England fans died a natural death albeit in the hands of the brave Croats on Wednesday after 120 minutes of exhilarating end to end football. This is one final no one likes to play, just when you’re at the brink of success, one brilliant moment from the opposition or one second of slack on your part and the dream is gone, now till November as Infantino announced the other day the next world cup in Qatar will be played over winter. Belgium gave a good account of themselves at this tournament, recorded a stunning comeback against the Japanese side in the round of 16, took Brazil to the cleaners in the quarterfinals before losing to a Samuel Umtiti header in the early exchanges of the semifinals. England on their parts should be named the surprise packages of the tourney, no one gave them a chance to get past the round of 16, they didn’t only beat Colombia, they went on to dominate and sweet Sweden aside to book a date with Croatia whom they led for a good number of minutes before succumbing to the relentless running of the finalists. 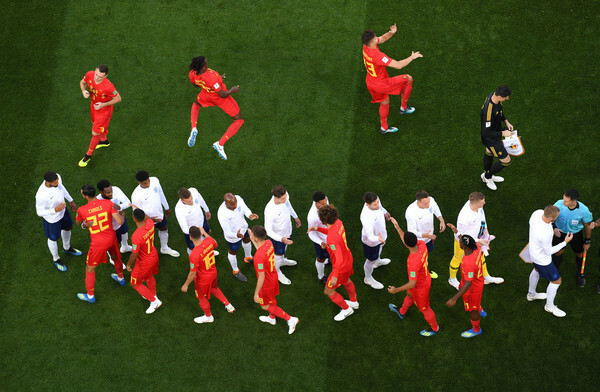 Both sides met in the group stage, that was the match that got many thinking England orchestrated their path to the semis with an intentional loss to the Red Devils, Adnan Januzai’s strike was a beauty of a curler that Jordan Pickford couldn’t do jack about, but interestingly, the context is different this time, while Belgium took the challenge and went on to face Brazil, England didn’t throw the advantage away, they rose to it and rode their luck until Mario Mandzukic wasn’t having any of the “It’s coming home” chants anymore with a sleek strike off the deep sleep of John Stones. Historically, not much importance is attached to this fixture, two hurting hearts coming together to make rebound off the other, what is worse than back to back defeats? England were here in 1990, they lost again, Croatia were here in 1998, twenty years ago, they beat the Orange boys of Netherlands to claim their first ever trophy at the global stage, who wants it more? Something has to come home for England, apart from the boys that are now heroes, the bronze pearl would still be accorded the respect of gold with an open bus parade throughout London. Belgium deserves something, they have loads of talent in every department, sparkling at the right time remains the only piece of the jigsaw for them. Roberto Martinez has made a huge statement with his tactics, he probably should have started Dries Mertens against France, his decision to compete in the midfield where the strength of France lies didn’t pay off, the Napoli winger showed what they lacked in the few minutes he played. Who wants it more? Both of them so expect this to be fiercely contested, they won’t give it to fringe players like they both did in the final group game, they will both go for this. Harry Kane seemingly let England down in the game against Croatia, had a few chances he couldn’t get anything on and could have squared Sterling in when the score was 1-0; Raheem Sterling should be rested for this game for Rashford to start. The Manchester City forward didn’t come to the party all along and shouldn’t be risked again, maybe Eric Dier in place of Henderson to sit deep and allow Jesse Lingard and Dele Alli to have a go at the Red Devils. At the other end, Moussa Dembele can start again, but the defense can be tweaked depending on what Martinez wants, technically he’s better than the highly conservative but effective Gareth Southgate, the latter was a criticized choice but he has overachieved, if left at the helm, the future is bright for the three lions who have the world champions from the U17 and U20 tournaments to latch on in future, they have a young squad sake for Ashley Young, Jamie Vardy and Gary Cahill who might be aged by the next time the world cup kicks off. This game would be an end to end stuff, nothing to lose that wasn’t lost at the semis already, enjoy yourself and give something great to the fans. England XI vs Belgium: Jordan Pickford; Kyle Walker, John Stones, Harry Maguire; Kieran Trippier, Dele Alli, Jordan Henderson, Jesse Lingard, Fabian Delph; Raheem Sterling, Harry Kane.